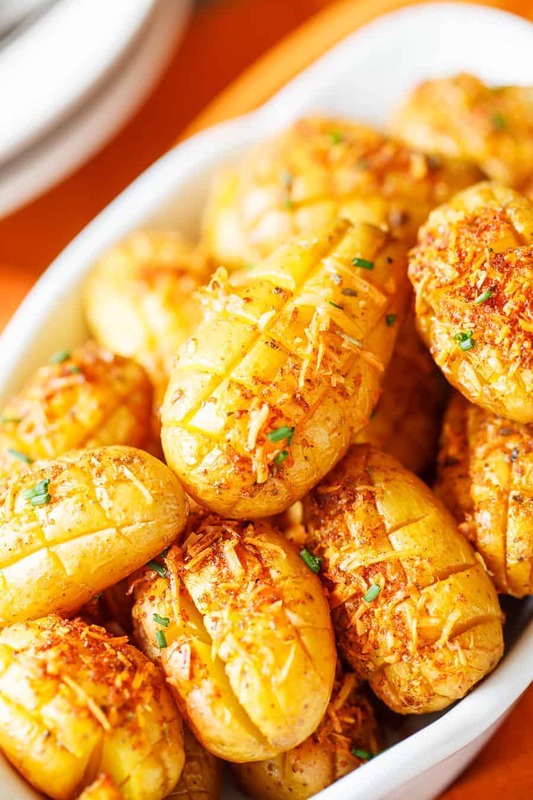 Fun, bite-sized Cheesy Roasted Potatoes are always a hit at our table. The potatoes are scored so they can absorb any flavor or seasoning you throw at them! These are like a miniature version of Hasselbeck Potatoes and they are glorious. 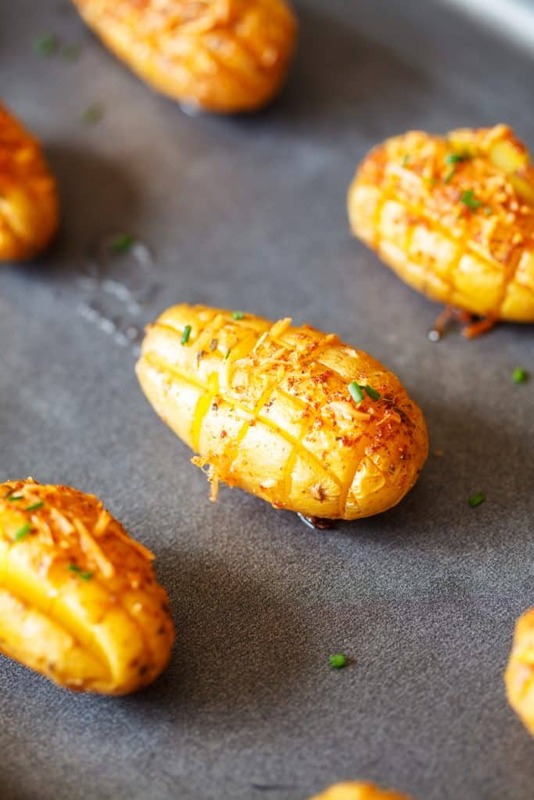 A crispy seasoned outside and a soft and fluffy inside, this cheesy roasted potato recipe is amazing. To make the potatoes, you will score them both lengthwise and widthwise. This allows the seasonings to reach inside of the potatoes while they are cooking. All of the flavors meld together in the middle making every bite perfection. 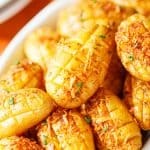 To make the score marks, I like to use chopsticks or grilling skewers to create a barrier at the bottom of the potato. This way, you won’t cut all the way through the potato when you score it, holding everything together nicely. Just place one chop sick on each side, hugging the sides of the potato together. Make your scores lengthwise, and then turn the potato and the chopsticks and make your widthwise cuts. What should I serve with Cheesy Roasted Potatoes? We are a meat and potatoes family, so really, when is a bad time to serve Cheesy Roasted Potatoes? I’d go with never. 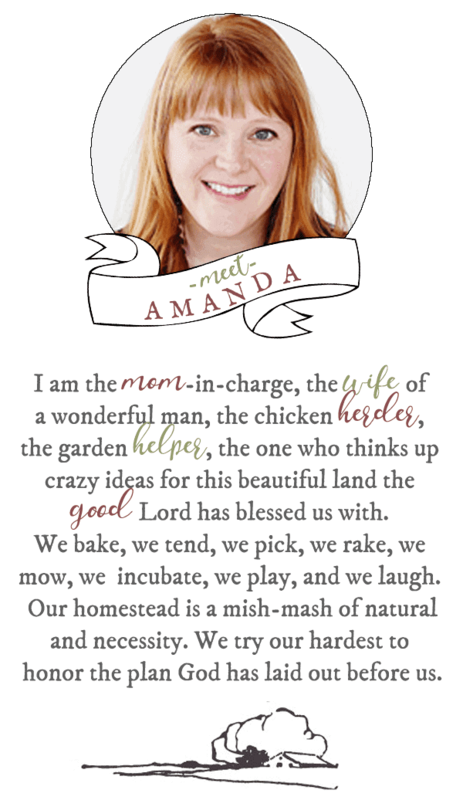 However, I like pairing meals and flavors as much as the next person, so I might have a few recommendations:) Browned Butter Pork Chops or Baked Pork Chops would both make an excellent choice for the main course. Did you make Cheesy Roasted Potatoes? Score each potato by creating 4 to 5 slits lengthwise and then widthwise. Do not slice all the way through. Arrange the potatoes on the baking sheet, scored side up. Pour the butter over the potatoes. In a small bowl, mix together the cheese, pepper, salt, garlic powder, paprika, and Italian seasoning. Sprinkle over the potatoes. Bake for 35 to 45 minutes until fork tender. Inspired by Eat Well 101. Photography by The PKP Way.